Corrosion Under Insulation (CUI) is the root cause of many of the global petrochemical industry’s most serious problems including forced shutdowns, lost production, early repair and replacement, as well as safety and environmental consequences that can cost millions of dollars per incident. CUI, which involves the corrosion of vessels or piping beneath insulation due to water penetration, is insidious because it can remain undetected until the insulation is removed for inspection or leaks occur. Water penetration can result from many causes including monsoons, rain, flooding, wash downs, and sprinkler systems, as well as exposure to steam, humidity, or frequent condensation and evaporation of atmospheric moisture. 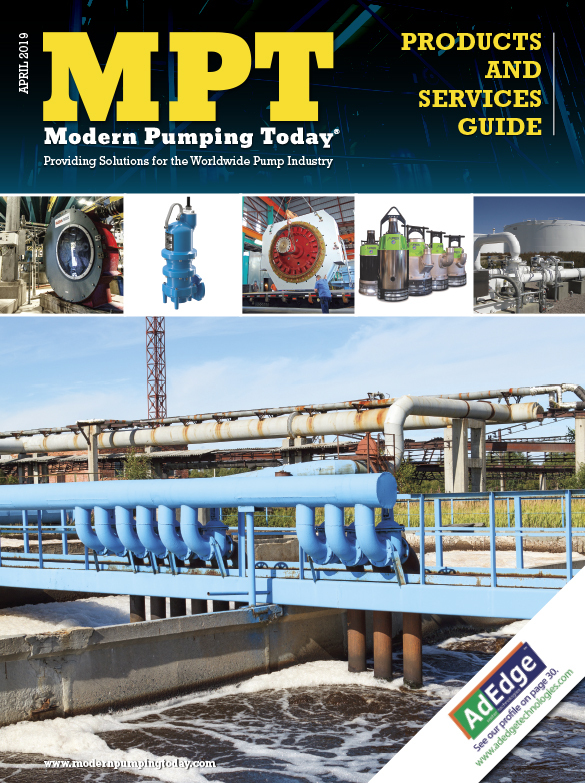 From upstream wells, risers, drilling rigs, or offshore platforms, to midstream pipelines, storage, and liquefied natural gas (LNG) terminals, to downstream refineries, fighting CUI and major corrosion has been an uphill battle and a major cost in the operation of oil and gas facilities, according to NACE International’s “International Measures of Prevention, Application and Economics of Corrosion Technology (IMPACT)” study. Fortunately, even when traditional coatings have allowed CUI and corrosion to occur, a new approach can stop the corrosion to dramatically extend facility and equipment life in oil and gas industry applications. Traditional corrosion protection typically involves applying polymer paints and rubber type coatings. Such methods create a physical barrier to keep corrosion promoters such as water and oxygen away from steel substrates. However, this only works until the paint is scratched, chipped, or breached and corrosion promoters enter the gap between the substrate and coating. Then the coating can act like a greenhouse—trapping water, oxygen and other corrosion promoters—which allows the corrosion to spread. Some of the world’s largest petrochemical companies, including China Petroleum and Chemical Corporation, however, are finding success with a new approach toward stopping CUI and corrosion. China Petroleum and Chemical Corporation, commonly known as Sinopec Corp., is one of the largest integrated energy and chemical companies in the world, with upstream, midstream and downstream operations. In Sinopec’s Jianghan Oilfield projects, located in China’s Jianghan Plain in Hubei province, there are numerous facilities for oil and gas extraction, transport, and storage. However, with Hubei’s sub-tropical monsoon climate, CUI and corrosion are serious issues that shorten equipment life and require excessive maintenance. In this environment, traditional coatings have been ineffective, and stopping corrosion that is already underway is often the last resort. To extend production and the service life of assets already experiencing serious CUI or major corrosion, on two sample projects Sinopec turned to EonCoat, a spray applied inorganic coating from the Raleigh, North Carolina-based company of the same name. EonCoat represents a new category of tough, Chemically Bonded Phosphate Ceramics (CBPCs) that can stop the corrosion, ease application, and reduce production downtime even in very wet, humid, monsoon prone conditions. In contrast to traditional polymer coatings that sit on top of the substrate, the corrosion resistant CBPC coating bonds through a chemical reaction with the substrate, and slight surface oxidation actually improves the reaction. The surface of steel is passivated as an alloy layer is formed. This makes it impossible for corrosion promoters like oxygen and humidity to get behind the coating the way they can with ordinary paints. Although traditional polymer coatings mechanically bond to substrates that have been extensively prepared, if gouged, moisture and oxygen will migrate under the coating’s film from all sides of the gouge. By contrast, the same damage to the ceramic coated substrate will not spread corrosion because the carbon steel’s surface has been chemically transformed into an alloy of stable oxides. Once the steel’s surface is stable (the way noble metals like gold and silver are stable) it will no longer react with the environment and therefore cannot corrode. Visible in scanning electron microscope photography, EonCoat does not leave a gap between the steel and the coating because the bond is chemical rather than mechanical. Since there is no gap, even if moisture was to get through to the steel due to a gouge, there is nowhere for the moisture to travel. This effectively stops atmospheric corrosion and CUI on carbon steel assets. The corrosion barrier is covered by a ceramic layer that further resists corrosion, water, fire, abrasion, impact, chemicals, and temperatures up to 400 degrees Fahrenheit (204 degrees Celsius). Beyond this, the ceramic serves a unique role that helps to end the costly maintenance cycle of replacing typical barrier type coatings every few years. 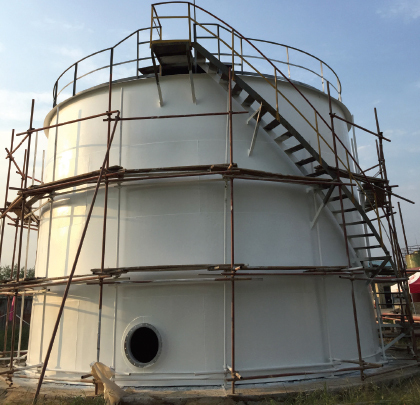 Sinopec’s first sample project using the CBPC coating involved addressing CUI on a 132,000 gallon petroleum storage tank in an oil-extraction facility in the Jianghan Oilfield. While the storage tank’s original coatings were wrapped beneath a mineral wool insulating layer, due to rain, condensation, and moisture invasion through the damaged insulating layer, these coatings had failed, allowing CUI in a number of areas. After peeling off the insulating layer, the metal surface underneath was prepared by sandblasting, then the CBPC coating was applied. The application has effectively stopped the CUI issue and is expected to extend the storage tank’s functional life for years to come. 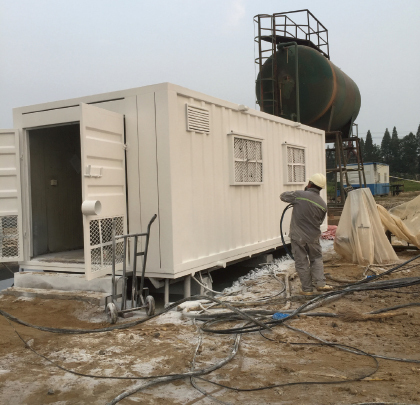 After the success of the first project, Sinopec opted to utilize the CBPC coating to address serious corrosion on a container-type water injection pumping station in another Jianghan Oilfield facility. 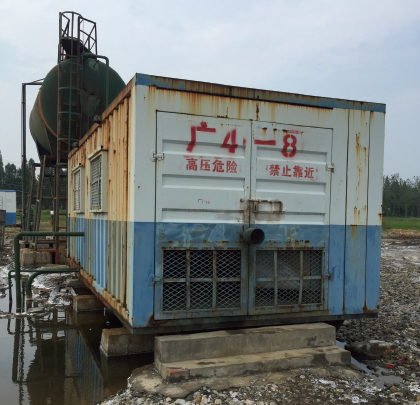 Because of the pumping station’s outdoor location with very high saline alkali content soil, along with a very humid container environment, shutdown for corrosion maintenance was typically required every three years. A traditional three coat system was routinely used to maintain corrosion protection for the pumping station, so coating application took at least three days to allow drying time for each layer. Including surface preparation, total required maintenance downtime was at least seven days, which hindered production. One of the greatest benefits of the CBPC coating, however, is the quick return to service that minimizes facility downtime. The time saved on an anti-corrosion coating project with the ceramic coating comes both from simplified surface preparation and expedited curing time. With a typical corrosion coating, near white metal blast cleaning (NACE 2 / SSPC-SP 10) is required to prepare the surface. But with the ceramic coating, only a NACE 3 / SSPC-SP 6 commercial blast is typically necessary. With traditional coatings, extensive surface preparation is required and done a little at a time to avoid surface oxidation, commonly known as ‘flash rust’, which then requires re-blasting. But with the CBPC coating, the flash rust is actually desirable. There is no need to “hold the blast.” The reason for this unique CBPC characteristic is due to the presence of iron in the rust, which helps to create the magnesium iron phosphate alloy layer. It is this alloy layer that allows CBPCs to so effectively protect carbon steel from corrosion. In contrast, a corrosion resistant coating for carbon steel utilizing the ceramic coating in a single coat requires almost no curing time. Return to service can be achieved in as little as one hour, which can potentially save hundreds of thousands of dollars per day in reduced oil and gas facility downtime. Because of these unique properties, total coating application including surface preparation of the Sinopec pumping station will take two days and the asset can be put into service immediately. EonCoat manufactures and sells its patented EonCoat® anti-corrosive coating to large industrial customers throughout the world. EonCoat is focused on preventing corrosion on a wide scale, and the company only works with corporations of significant size, often those that are publicly traded with multinational operations. 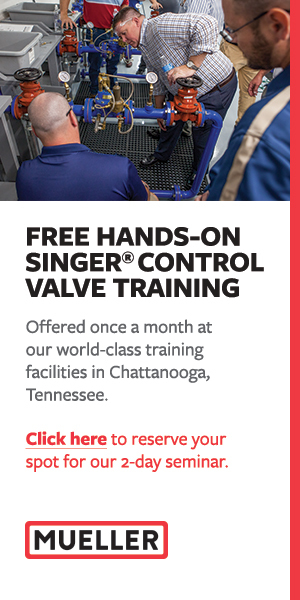 For more information, call 754.222.4919 or visit www.eoncoat.com.